For ease of viewing, I have uploaded the extended (1993) documentary film to YouTube: A Sarajevo Diary - From bad to worse. On April 5th 1992, the Army of Republika Srpska of the self-proclaimed Serb Republic, along with the Yugoslav National Army (JNA), began a siege on the city of Sarajevo in Bosnia and Herzegovina that lasted nearly four years until February 29th, 1996. In the winter between 1992 and 1993, my late grandfather Bill Tribe travelled to the besieged city with a Channel 4 (UK) film crew to make a documentary on the war, and how it affected the residents of Sarajevo and my family in particular. 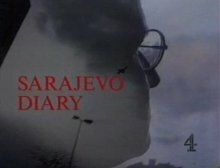 A Sarajevo Diary is a documentary filmed by my grandfather on the atrocities being committed in Sarajevo during the 1992-1995 war in Bosnia-Herzegovina. It is definitely worth watching, and covers Sarajevo's desperate situation and unstoppable spirit during the war. Even if history is of no interest, I'm sure you'll find this interesting. The film is actually quite personal and covers my family's situation at the time, and it really emphasizes what horrors were being ignored by other nations at the time. There is an updated documentary filmed later in 1993 when Bill and the film crew returned (A Sarajevo Diary - From bad to worse) that contains about 25 minutes of extra footage, including an interview with Vedran Smailović and a happy end to my dad's effort to get out of the country. It begins with the original film, with slightly different editing. About 10 minutes have been trimmed, and I think there is some extra stuff here and there. I've only done one encoding so far. I have been in touch with the director Dom Rotheroe and he gives his blessing to redistribute this reasonably freely. If you found it interesting or would like to know more, feel free to send an email to . I think there's some important lessons to be learnt here, so spread the word. If you would like DVD-playable copies, I can arrange that and post them to you as well. The 1992 documentary is roughly 50 minutes long, and the 1993 roughly 1 hour 5. The actual video is from a VHS cassette recording of a Channel 4 TV broadcast, so it is not of optimum quality. There's nowhere else to get it on the Internet though, so below are encodings of it. If you have a slow computer that can't play H264 video then take the XVID version, otherwise the H264 encoding is of superior size and quality. The quality on the XVID encoding is actually very bad. I've only made one encoding of this, and it's significantly bigger. It is really good quality (relatively of course), so I think this is a worthy tradeoff. The following software will allow you to play the videos easily.